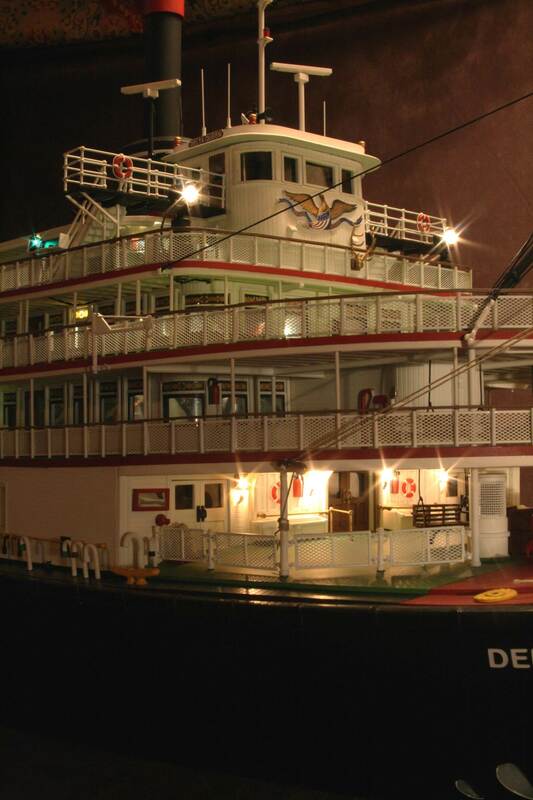 John Weise in the last week received photos from his friend Bill Johnk, in Boulder, Colorado who recently finished his model of the Delta Queen which was built from John's plans that he made during the early 1990's. 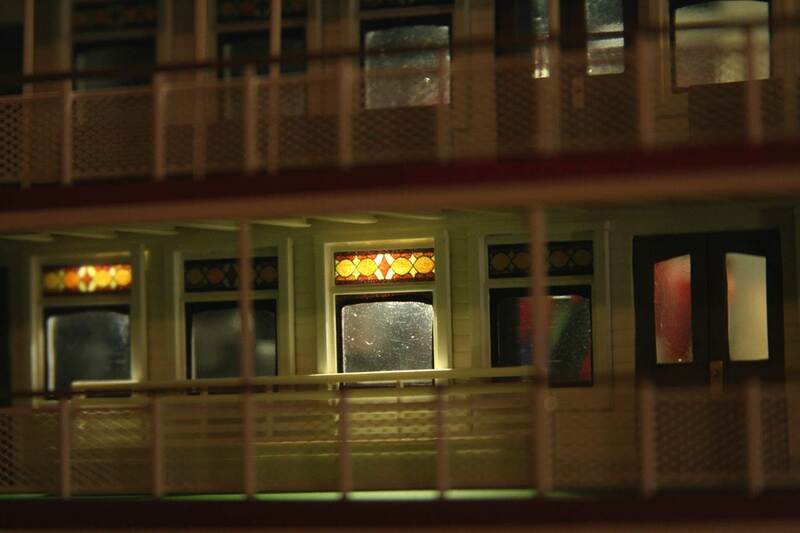 It took 6-1/2 years to complete his model & said it was the toughest model he had ever constructed. 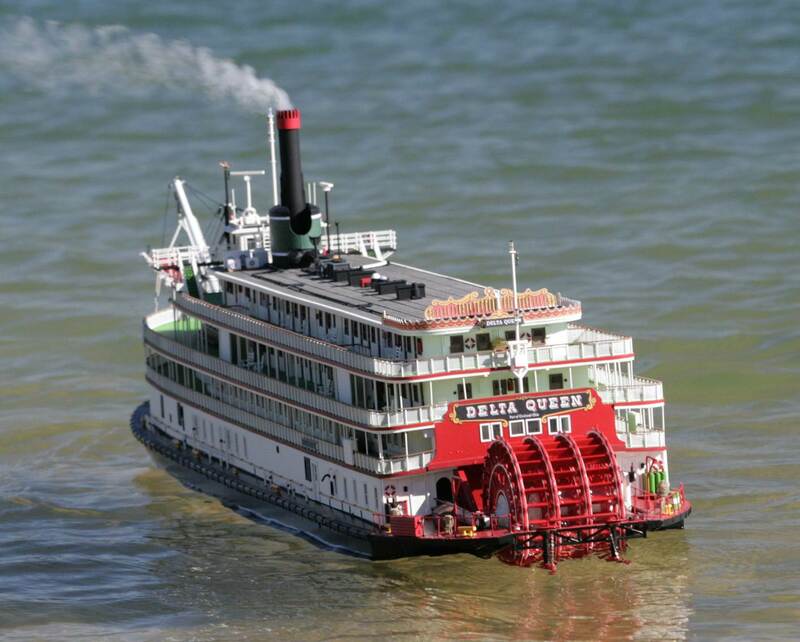 Bill is a professional model builder & has built many dioramas in the past but this was his first & only steamboat model. John will present some information of this model next week in our meeting. Bill built his model from my plans which are 1/50th scale which he downsized to 1/64th scale as he didn't have enough room in his workshop to build a larger model. My model is sized to use the Hartman/Loyal Hanna fiberglass hull which Dwight Hartman cast olds off of the plugs I built for the hull & main deck. Bill had to build his own hull since it was smaller in length. My hull is 60 inches long compared to Bill's hull length of 45.625". The weight of my model would be 53# compared to Bill's 22#. This seemed off to me but I did the math & it's actually pretty accurate. The weight is 22 pounds including the batteries, and the scale is 3/16" to a foot. The total length from the end of the stage to the back of the fantail is 62". I am using a seven channel transmitter and receiver with a separate little 2 channel unit to turn on and off the lights and to turn off the smoke when it runs out of oil. If I could have foreseen that I would need 9 channels at the beginning, that's what I would have purchased, but I couldn't deal with the cost and redesign at this point. 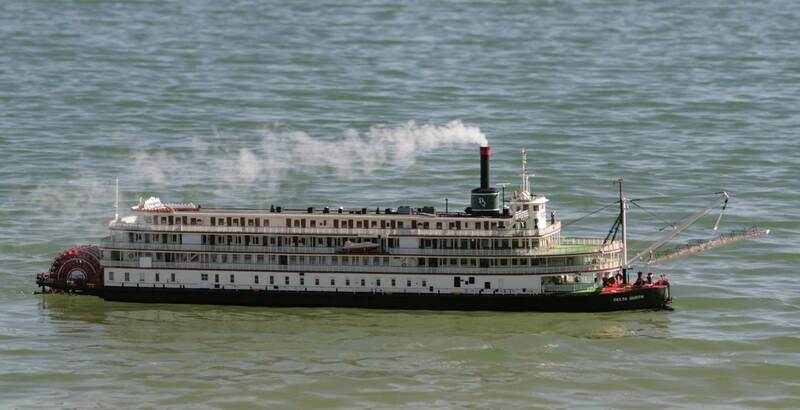 One channel runs the paddlewheel and proportional smoke generator both forward and reverse. Both the paddlewheel motor and the bow thruster have independent speed controllers. 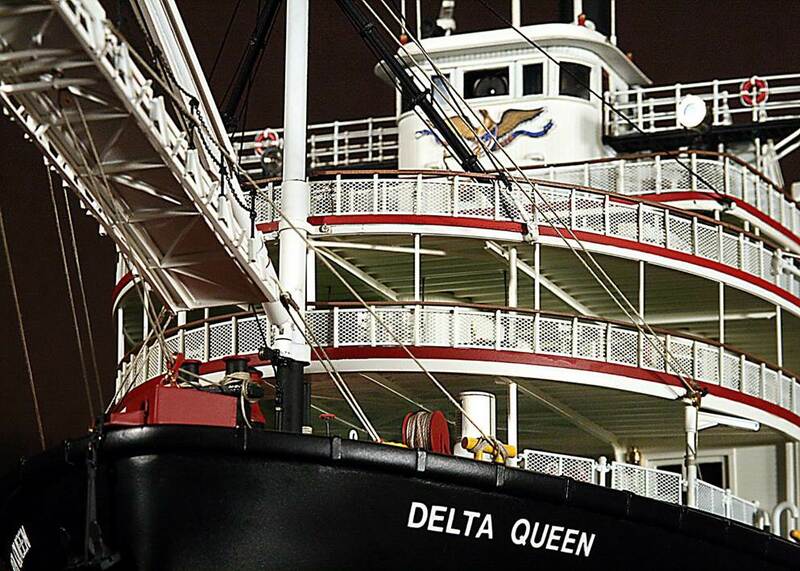 Then there are three more channels for the sounds, which are digital recordings of the actual Delta Queen for the bell, the steam whistle, and the Calliope. There is one channel for the bow thruster (which is absolutely essential for good control) and one channel for the rudders. The seventh channel works a double relay that controls the on/off for both rotation of the radar antennas and the wireless video camera that is mounted in the pilothouse. Everything worked well on the initial outing. The video transmission still needs some fine tuning. The reception is a bit sporadic sometimes. By the way . . . No, the smokestack does not fold down!